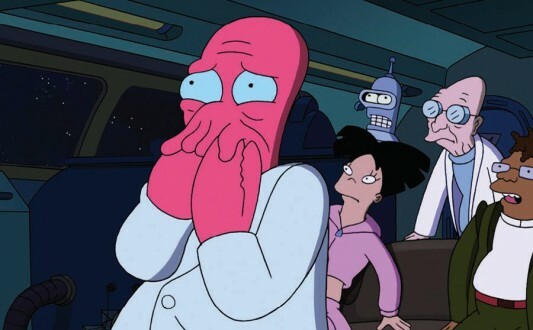 ‘Futurama’ Gets Cancelled … Again … But Is It Really The End? There’s a few dead TV shows we here at Geeks of Doom have helped the masses fight particularly hard to see resurrected. Of these shows, the two fought hardest for have been Firefly, of course, and the animated favorite Futurama. The show set a thousand years in the future initially ran from 1999 to 2003 on Fox before it was ultimately canceled. But the eventual release of four direct-to-DVD movies and the relentless passion of the show’s fans paid off, and, to ours and many others’ surprise and delight, it was eventually decided to bring Futurama back to life. The show’s return scored big numbers—numbers that were praised at the time—and the show’s Facebook page passed 10 million likes, proving the lasting and ever-growing fanbase. Only two years later, the page now sits at 26 million likes. How’s that for growth? But alas, it wasn’t enough. It’s been reported that Comedy Central has decided to cancel the show for its second time, and that the final 13 episodes of season seven, which are set to begin airing this June, will be the last. The numbers for Futurama have been declining, that much is true. Averaging 2.6 million viewers when it first returned in 2010, the show averaged 1.7 million viewers in 2012. One can’t help but wonder how, out of 26 million fans on Facebook, only a couple million were tuning in to watch after fans fought so hard to get the show back. At the same time, one might also think a show this popular and quoted and talked about might be kept around at an average 1.7 million viewers. The answers, most likely, are found in the evolution of TV-watching tendencies. People simply don’t watch TV shows when they’re on anymore. Some people record them on their DVRs and watch later. Others watch on demand. Some watch later on Netflix. There are so many ways to watch your favorite shows these days, looking at the number of viewers and making important decisions based on those numbers seems absurd. If the declining number of viewers they thought they had was the only reason Comedy Central decided to cancel the show, you’ll have to excuse us as we scratch our heads in confusion. That said, you won’t find anger and outrage aimed at Comedy Central this day. The fact that the show came back in the first place is something I and many others will always be thankful for, and it’s unfortunate it wasn’t able to find another long run on the network. But is this really the end for Futurama? Don’t plan a memorial service just yet. As mentioned above, TV-watching tendencies are evolving, and in a big way. We’re seeing companies like Netflix—once a villain and now a savior—not only getting into the original programming game, but also reviving dead shows like Arrested Development and rescuing near-dead shows from the Reaper’s scythe like The Killing (but still not Firefly *shakes fist*). Then there’s Amazon and others like them who are trying to grow into a Netflix competitor. There’s more options than ever before. Because of this, Futurama‘s producers WILL be looking into options for other potential homes for the series. Hear that Netflix? Easiest business decision ever. And you don’t even have to pay me an employee bonus. “We’ve been in this situation before and it’s tempting when you’re doing episodes that are as good or better than anything you’ve ever done to continue doing it. We’re catching our breath and seeing what the fans have to say. The experience of this show has been so much fun from the very beginning to now — everybody is so happy to work on this show — that it’d be a shame if we all went our separate ways… We would love to continue. We have many more stories to tell. But if we don’t, this is a really great way to go out… I think these episodes are the best ones we’ve ever done. It’d be one thing if everyone involved was ready to move on to other things, but clearly they are not. If no one out there jumps on this immediately, well…I don’t want to live on this planet anymore.